WE HAVE joined forces with QSuper to bring you inspiring stories of their members taking part in the Queen's Baton Relay. As a young swimmer, Rockhampton's Dion Schloss dreamed of one day representing his country at the Olympic or Commonwealth Games. The need for full-time employment sadly put an end to that dream but thanks to his wife Lea and his workmates, Dion will be involved in the Gold Coast 2018 Commonwealth Games, as part of the Queen's Baton Relay. "I was absolutely surprised, and completely honoured,” Dion said, of his batonbearer nomination. 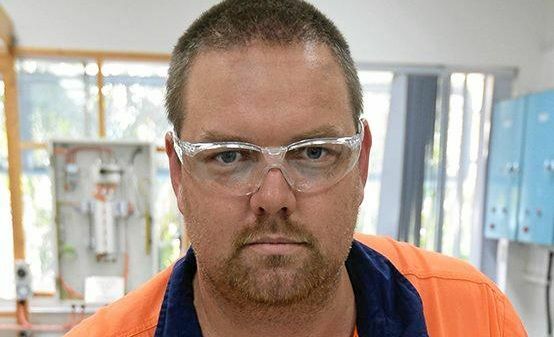 The 34-year-old electrician and QSuper member says he initially signed up with the volunteer organisation six years ago, to meet new people and put his range of skills to good use. "It's one of those things - you've got to have the drive to want to do something to help others,” Dion said. At 198cm tall and weighing 150kg, Dion says he tended not to get up on storm-damaged rooftops. "I'm the last person you'd want to put up on a roof with a bit of damage,” he said. What will make the Queen's Baton Relay even more special for Dion, is that when he finishes his 200m leg along Keith St in Rockhampton's South on March 23, he will be passing the baton to his own daughter, Elaina. "The 11-year-old was nominated by friends and family for her amazing efforts to raise money for the RSPCA. "She raises chickens and sells them, donating the proceeds to the RSPCA," says the proud dad. Dion said it's immensely satisfying to see his own community spirit shared by his daughter.